Q1. How to use tload? Q2. Does tload provide any scaling option? Q3. How to set delay in graph updates? While there are a lot of UI-based tools in Linux that you can use to see a graphical representation of system load, the number of command line tools that do the same work is pretty less. One such utility is tload, which will be discussing in this tutorial. the tload process if none is specified). Following are some Q&A-styled examples that should give you a better idea on how the tload command works. The graph, as you can see, consists of symbols like *, =, and -. While the tool's man page doesn't say anything about these symbols, there's some useful explanation about this on a serverfault thread. the bar passes the line that marks the unit of the graph. between  graph  ticks);  thus, a smaller value represents a larger scale, and vice versa. 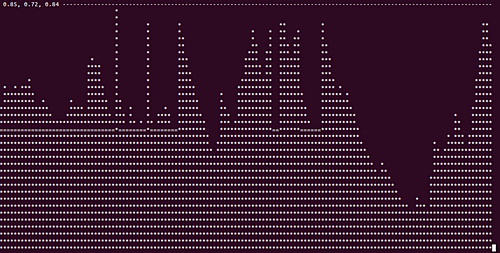 When you run the tload command, you'll notice that the graph it produces continuously updates. However, if you want, you can set a delay between graph updates. This command will ensure the graph updates after 5 seconds. Agreed, this command is mostly for system admins. The number of options it offers is also limited. We have already discussed the major options this utility offers. To learn more, head to the tload man page.